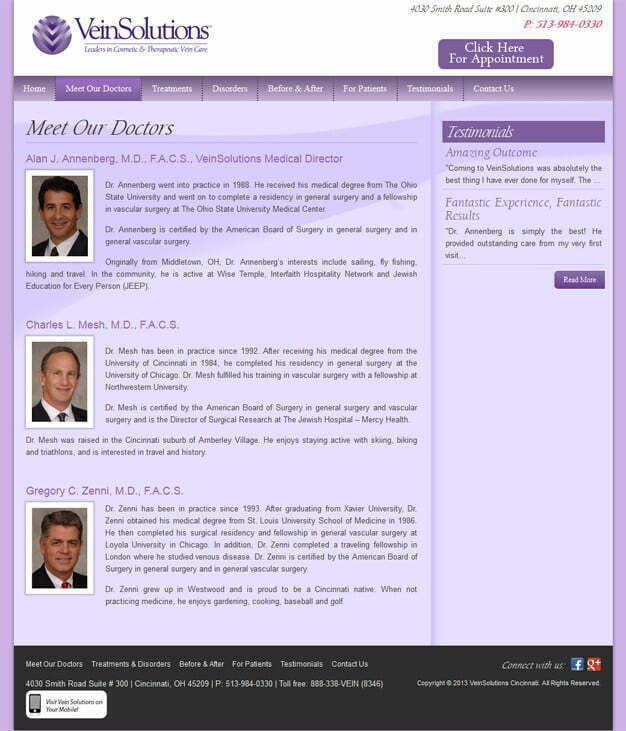 Founded in 1999, VeinSolutions of Cincinnati is a division of Cardiac, Vascular & Thoracic Surgeons, Inc. (CVTS), an award-winning group of board-certified physicians specializing in cardiac, thoracic and peripheral vascular surgery. 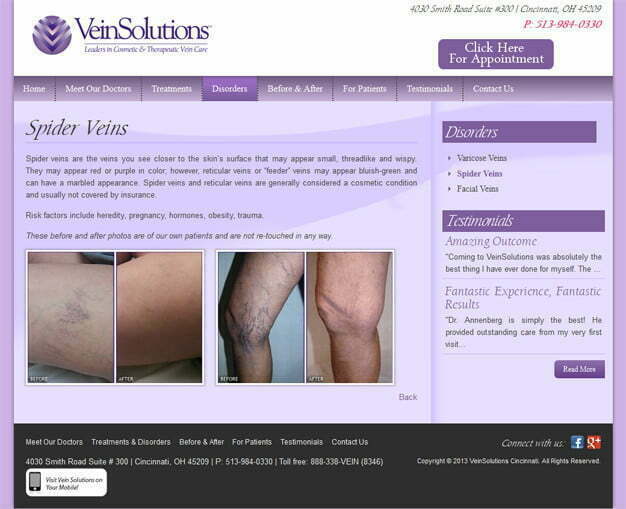 The goal of VeinSolutions is, unlike some other vein treatment centers, to deliver the highest quality patient care with professional integrity and an unwavering focus on each patient. To meet the needs of specific disorders and provide the appropriate treatments, our board-certified peripheral vascular surgeons are dedicated to using state-of-the art technologies in the cosmetic and therapeutic treatment of any vein problems. Experience and training are paramount for knowledgeable staff who assist you with everything from understanding your diagnosis and treatment options, to coordinating with insurance companies and establishing easy payment options. These surgeons stay abreast of the most innovative forms of vascular treatment by participating in research, continuing education and international professional meetings and will personally perform every treatment, from non-invasive to surgical. VeinSolution realized the scope of expanding their base of exposure and accessibility to patients required a professional web platform, and turned to Pulse to provide the full web development service. Using PHP and WordPress, Pulse provided a custom web design that integrated with mobile accessibility, easy navigation, minimal maintenance and a high level of usability. 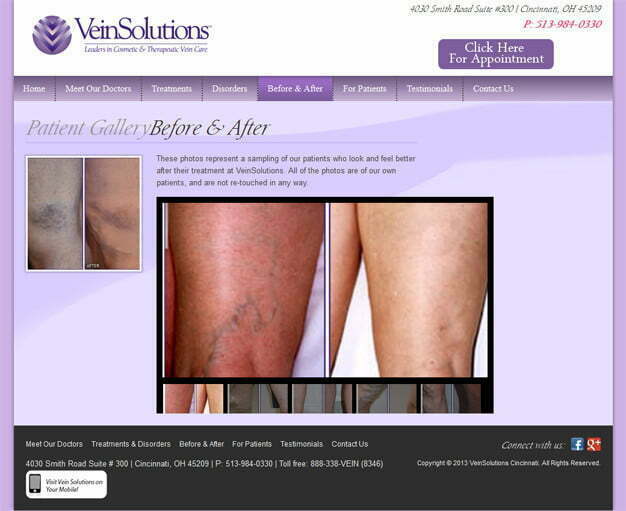 The user friendly, cascading tabs reflect clear treatment solutions for easy reference and an advance knowledge of each surgeon’s qualifications generates confidence in the ability to solve all cosmetic and therapeutic vein care. 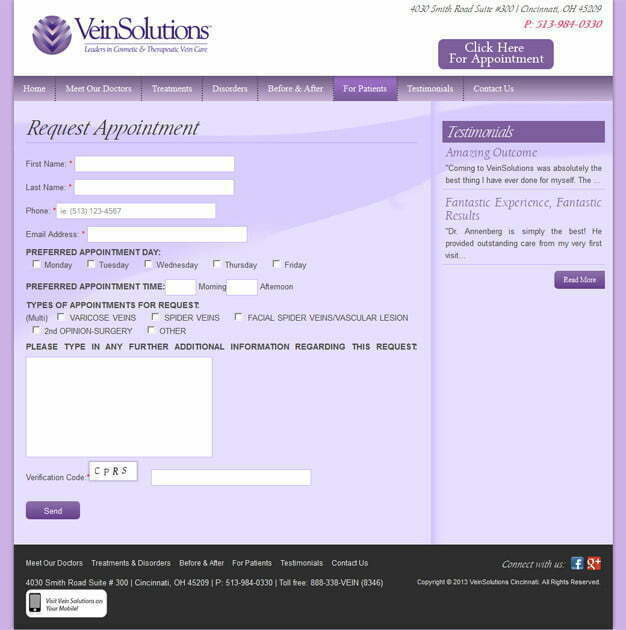 Once the division of services, experience and patient material was incorporated, VeinSolutions could now offer better service, easier accessibility, including the ability to set an appointment with just a touch on the mobile screen, enabling a greater scope of treatment for those in need. VeinSolution is thrilled with the new opportunities arising from having web support and the added benefits of Pulse’s careful development to accommodate all their specific requirements in a short span of time. Contact us for your web designing needs.